His attempt to de-insure millions of people who had finally received healthcare coverage and, along the way, enact a massive transfer of wealth from the poor to the rich has been put on hold for the moment. But he is proceeding with his efforts to defang the government’s regulatory agencies and bloat the Pentagon’s budget even as he supposedly retreats from the global stage. These are immensely dangerous developments which threaten to weaken this country’s moral standing in the world, imperil the planet and reverse years of slow but steady gains by marginalized or impoverished Americans. But, chilling as they are, these radically wrongheaded policy choices are not, in fact, the most frightening aspect of the Trump presidency. Become a subscriber today to support editorial writing like this. Start getting full access to Times signature journalism for just 99 cents for the first four weeks. Although his policies are, for the most part, variations on classic Republican positions (many of which would have been undertaken by a President Ted Cruz or a President Marco Rubio), they become far more dangerous in the hands of this imprudent and erratic man. Many Republicans, for instance, support tighter border security and a tougher response to illegal immigration, but Trump’s cockamamie border wall, his impracticable campaign promise to deport all 11 million people living in the country illegally and his blithe disregard for the effect of such proposals on the U.S. relationship with Mexico turn a very bad policy into an appalling one. 1 Trump’s shocking lack of respect for those fundamental rules and institutions on which our government is based. Since Jan. 20, he has repeatedly disparaged and challenged those entities that have threatened his agenda, stoking public distrust of essential institutions in a way that undermines faith in American democracy. He has questioned the qualifications of judges and the integrity of their decisions, rather than acknowledging that even the president must submit to the rule of law. He has clashed with his own intelligence agencies, demeaned government workers and questioned the credibility of the electoral system and the Federal Reserve. He has lashed out at journalists, declaring them “enemies of the people,” rather than defending the importance of a critical, independent free press. His contempt for the rule of law and the norms of government are palpable. 2 His utter lack of regard for truth. Whether it is the easily disprovable boasts about the size of his inauguration crowd or his unsubstantiated assertion that Barack Obama bugged Trump Tower, the new president regularly muddies the waters of fact and fiction. It’s difficult to know whether he actually can’t distinguish the real from the unreal — or whether he intentionally conflates the two to befuddle voters, deflect criticism and undermine the very idea of objective truth. Whatever the explanation, he is encouraging Americans to reject facts, to disrespect science, documents, nonpartisanship and the mainstream media — and instead to simply take positions on the basis of ideology and preconceived notions. This is a recipe for a divided country in which differences grow deeper and rational compromise becomes impossible. 3 His scary willingness to repeat alt-right conspiracy theories, racist memes and crackpot, out-of-the-mainstream ideas. Again, it is not clear whether he believes them or merely uses them. But to cling to disproven “alternative” facts; to retweet racists; to make unverifiable or false statements about rigged elections and fraudulent voters; to buy into discredited conspiracy theories first floated on fringe websites and in supermarket tabloids — these are all of a piece with the Barack Obama birther claptrap that Trump was peddling years ago and which brought him to political prominence. It is deeply alarming that a president would lend the credibility of his office to ideas that have been rightly rejected by politicians from both major political parties. Where will this end? Will Trump moderate his crazier campaign positions as time passes? Or will he provoke confrontation with Iran, North Korea or China, or disobey a judge’s order or order a soldier to violate the Constitution? 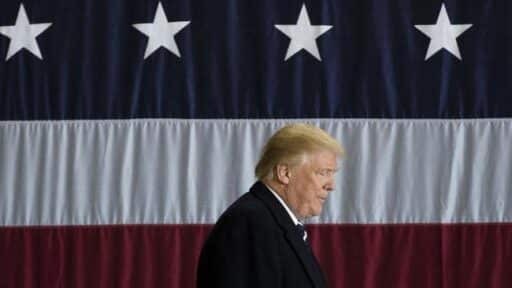 Or, alternately, will the system itself — the Constitution, the courts, the permanent bureaucracy, the Congress, the Democrats, the marchers in the streets — protect us from him as he alienates more and more allies at home and abroad, steps on his own message and creates chaos at the expense of his ability to accomplish his goals? Already, Trump’s job approval rating has been hovering in the mid-30s, according to Gallup, a shockingly low level of support for a new president. And that was before his former national security advisor, Michael Flynn, offered to cooperate last week with congressional investigators looking into the connection between the Russian government and the Trump campaign. On Inauguration Day, we wrote on this page that it was not yet time to declare a state of “wholesale panic” or to call for blanket “non-cooperation” with the Trump administration. Despite plenty of dispiriting signals, that is still our view. The role of the rational opposition is to stand up for the rule of law, the electoral process, the peaceful transfer of power and the role of institutions; we should not underestimate the resiliency of a system in which laws are greater than individuals and voters are as powerful as presidents. This nation survived Andrew Jackson and Richard Nixon. It survived slavery. It survived devastating wars. Most likely, it will survive again. But if it is to do so, those who oppose the new president’s reckless and heartless agenda must make their voices heard. Protesters must raise their banners. Voters must turn out for elections. Members of Congress — including and especially Republicans — must find the political courage to stand up to Trump. Courts must safeguard the Constitution. State legislators must pass laws to protect their citizens and their policies from federal meddling. All of us who are in the business of holding leaders accountable must redouble our efforts to defend the truth from his cynical assaults. The United States is not a perfect country, and it has a great distance to go before it fully achieves its goals of liberty and equality. But preserving what works and defending the rules and values on which democracy depends are a shared responsibility. Everybody has a role to play in this drama.